As of late, I’ve been hard at work spreading the word of Me Squared. 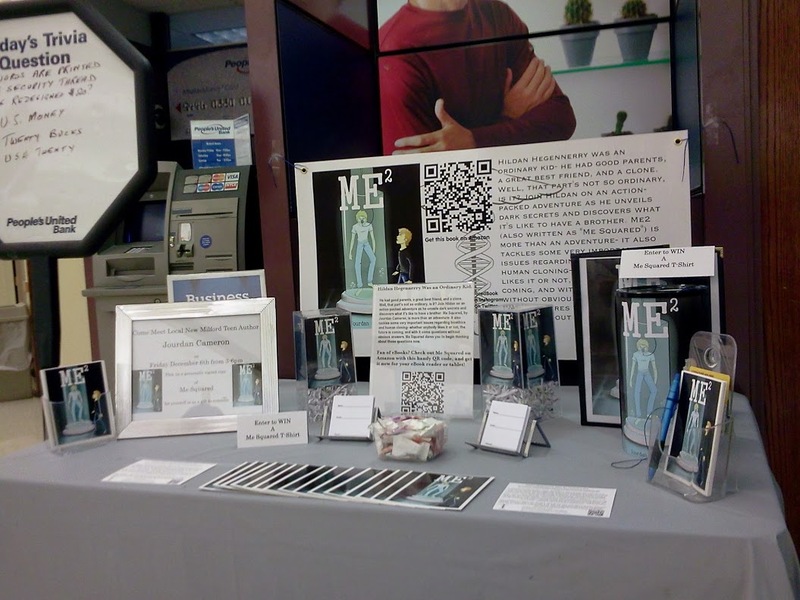 I recently held and event at my local People’s United Bank, which has a special spotlight for local businesses. The event went pretty well; plenty of people got to hear about my book, and I’d really like to thank the folks at my local People’s, especially Cynthia. They were all very helpful and cooperative, I’d definitely recommend doing banking there. I’ve also created a press release for my book- it’ll go up on my press page as soon as that’s ready. If you’re a reviewer, this contains everything you need to know about my book- if you’re interested, please be sure to contact me and I’ll send you a review copy right away! Visit http://mesquaredbook.com for more details, images, and an author bio. Me2 (Me Squared for the sake of formatting), the debut sci-fi novella by Jourdan Cameron, stars Hildan Hegennerry, an ordinary kid whose life takes a turn for the extraordinary when he discovers he has a clone. Join Hildan on an action-packed adventure as he unveils dark secrets and discovers what it’s like to have a brother. Me Squared is more than an adventure- it also tackles some very important issues regarding bioethics and human cloning- whether anybody likes it or not, the future is coming, and with it come questions without obvious answers. Me Squared dares you to begin thinking about those questions right now. Right now, Me Squared is available for review- please contact Jourdy288(at)gmail.com for a review copy or to schedule an interview with the author.